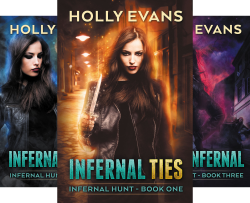 Infernal Hunt is the first Urban Fantasy series I published. Readers can begin with either Infernal Ties or Infernal Bonds. Infernal Ties is a prequel novella. The Hawke twins are hunters. They keep the supernal community of Prague in line, and they’re good at it. The witches whisper their names when something goes bump in the night, and the lycans tell stories of them to make their cubs behave. When Quin doesn’t come home after what should have been a quick rogue-disposal, Evie begins to worry. Evelyn Hawke is a force to be reckoned with. Nothing and no one will stop her from getting her twin back. 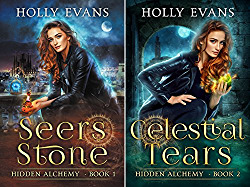 She’ll do whatever it takes, even dive into the supernal world and work with those she despises to find Quin and dig him out of the very large hole he’s got himself into. Little does she know the far-reaching consequences of her actions. Infernal Ties is the prequel novella, sitting at some 30,000 words. Infernal Ties begins the larger plot. 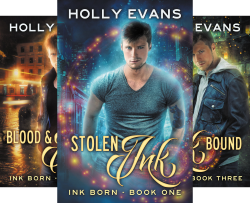 Infernal Bonds is available on Amazon for $2.99.